The iPhone 7’s 3.5mm headphone jack mystery seems to be getting murkier. While conflicting rumours continue to surface, there is a different debate on what the accessory will be boxed in, if Apple decides to ditch the headphone jack. A recent report suggested that Apple will ship the regular 3.5mm EarPods in the box alongside a Lightning-to-3.5mm adapter – and not the Lightning-powered EarPods rumoured to accompany the 3.5mm jack lacking iPhone 7. However, a new leak has now surfaced revealing images of the Lightning-powered EarPods. 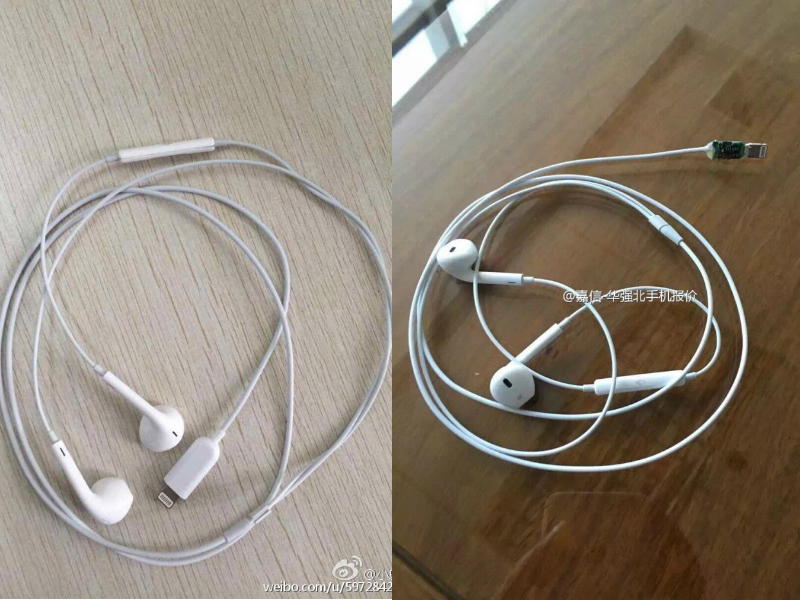 These images come out of Chinese social media site Weibo (via iPhone7.nl), and show the Lightning connector at the end of the EarPods. The connector appears to be a little larger than normal, and it could be to resolve user complaints about it being too easy to damage. In any case, these images could just very well be doctored, so we recommend you to take the leak with a pinch of salt. If the company loses the 3.5mm headphone jack, Apple is said to house two speaker grilles on both sides of the Lightning port. Whether the speakers will be on ‘monaural system’ or stereo is also uncertain. The company is also expected to be working on wireless EarPods, something on the lines of Bragi Dash. The removal will reportedly also help Apple reduce the thickness of the iPhone 7, while also making water resistance simpler to implement. If all goes as tradition, the iPhone 7 will be released in the beginning of September. It is expected to come in three variants – iPhone 7, iPhone 7 Plus, and iPhone 7 Pro. The large variant is expected to come with a dual camera setup, a Smart Connector at the back, and a 3GB RAM bump. There is also a pegged new A10 processor, with a reimagined Force Touch Home Button.